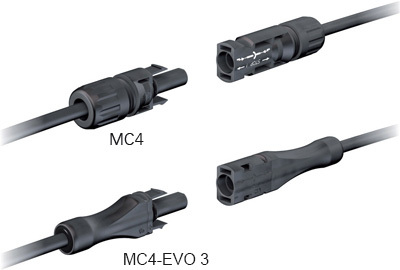 Multi-Contact’s photovoltaic connectors MC4 and MC4-EVO 3 have recently been certified for protection class IP68. With the highly efficient, TÜV and UL certified connectors, the entire PV installation may be cabled consistently with a single system. The pre-assembled MC4-EVO 3 (1500 VDC TÜV / 1000 VDC UL) is partucularly suited for module manufacturers and for installations with large cable cross sections. The original MC4 (1000 VDC TÜV / 600 VDC UL) has proven successful during the past 10 years in installations worldwide; it is available pre-assembled as well as for on-site assembly. Thanks to the MC Multilam Technology, the MC4 system ensures reliable power transmission with little power loss and high efficiency.